Well, my phone call with my new editor went very well. She really likes it, and she does want changes, but of the “more of this” variety, and none of the “less of this” and more importantly no major over-hauling. So yay!! I’m running down to the Library of Congress to check a few archives. I have to get there and back in a day and I’ve been emailing with a librarian to work out the logistics. I’m literally going to jump on a bus and take a 4 hour plus ride to DC, run over to the Performing Arts Reading Room, take pictures like mad (they won’t let you copy older materials, but you can photograph them) then run back to Union Station and jump on a bus back home. I’ll be leaving the house at 7:20am and getting back around 10:30pm. Quite the whirlwind of a day! 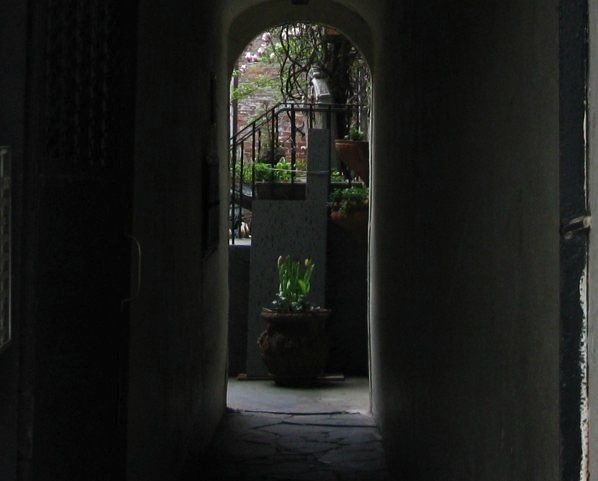 A semi-secret garden in the West Village. Where did I see this? Morton Street? But this is looking down what was probably an alley leading to a stable for horses.